XI'AN, China, March 13, 2019 /PRNewswire/ -- Xi'an, one of the oldest cities in China and once an imperial city during the periods of the Sui and Tang dynasties 1,300 years ago, has launched a "Flower City" project to build a system of flower-lined streets, gardens and paths, as well as flower-filled galleries and fields to recreate an ancient flourish and beautiful sight-seeing experience for both residents and tourists. With a total of 15,220 kilometers of greenways planned, the project will add gardens that cover more than 6 million m2 and greenways of more than 500 kilometers with 50 flower-lined streets. Major construction projects include 6 theme parks, 2 heritage parks and tens of street gardens by 2019. According to Li Pingwei, Director of the Xi'an Urban Management and Law Enforcement Bureau, the projects aims not only to shape a green city through significantly improving the coverage of flowers and plants, but also to reproduce the charm of flower appreciation in ancient times in which tourists and citizens can enjoy an all-year blossom season in town. "This is a key project for Xi'an in 2019 and we look forward to delivering it through infrastructure and decoration projects. 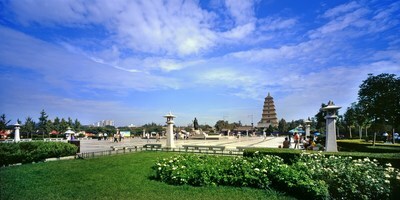 Xi'an was the starting point of the famous Silk Road. Centuries ago, it was one of the largest cities in the world. Thousands of international traders and merchants gathered to this promising land full of green and fortune. We would like to recreate the ecosystem of that day for guests from all around the world so that they can find a combination of history of modern elements here," Li said. Centered in the ancient city area and expanded to the new town, the project will cover both functional and leisure areas from highways and roads around hotels to parks and local communities, framing an open and diverse city with multiple ecosystems. Through this project, Xi'an will be transferred into a colorful city where avenues, parks and paths are designed based on plant color, smell, size and season and are differentiated on a regional basis, forming distinctive landscapes. In addition, green industries will be involved along with public engagement, including the introduction of a flower industry to the city. Residents will have a 15-minute access to the greenways upon project completion. Tourists and citizens will be offered flower viewing maps so that they can plan their visits accordingly. The capital of China's western Shaanxi province, Xi'an is an international tourist destination with over 3,000 years of history and world-renowned attractions such as the Terracotta Warriors and Horses and its ancient City Wall. The city, dubbed "China's outdoor museum," was the starting point of the Silk Road, an ancient network of trade routes established during China's Han Dynasty that linked the East and the West in commerce.